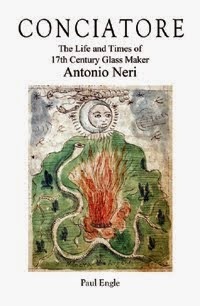 Nef Ewer, Late 16th century, Murano Italy. On the afternoon of Friday, 22 March 1521, The Venetian Senate - then called the ‘Pregadi’ - reconvened after lunch. Senator Marino Sanuto (the Younger) recorded in his now famous diary that among the afternoon business was the granting of a ten year exclusive license to Arminia, the daughter of painter ‘Alvise da Muran’ (Luigi Vivarini). She was granted this privilege to produce the ornamental glass galley ships she had recently devised. [1,2] Once called 'Navicella' (little ships) these ewers, probably most used to serve wine, are now known as ‘nefs’. A pour spout was situated at the ship's bow, and often a handle astern. These objects soon became iconic symbols of the island-nation’s long dominance in trade, and regularly appeared on sideboards and elaborate dinner table settings, not only in the lagoon, but in Florence, Rome and far beyond. 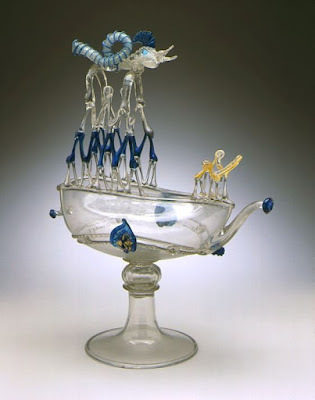 Arminia Vivarini’s father was a painter of some renown, but her family is also among the earliest recorded glassmakers on Murano. Her third-great grandfather, named Vivarino, arrived from Padua, just ahead of the plague in 1346. The family seems to have been involved in the craft on the island from then on. She clearly had access to a furnace, perhaps one owned by an uncle or a cousin. In any event, she exemplified the qualities of the very best glass artisans throughout history: a clear design sense coupled with technical expertise and the opportunity to put them both into practice. Arminia (Armenia, Ermonia) Vivarini (1490-1569). See Luigi Zecchin: Vetro e Vetrai di Murano, 3 vols. (Venezia: Arsenale, 1987-9) v.3, p. 194. Marino Sanudo: I diarii di Marino Sanuto (1466-1536) v.30. Eds., F. Stefani, G. Berchet, N. Barozzi (Venezia: Fratelli Visentini, 1891) col. 45. Also see Zecchin 1987-9, v.2, p.276. Luke Syson, Dora Thornton: Objects of Virtue: Art in Renaissance Italy (Los Angeles: J. Paul Getty Museum, 2001), p. 197.
 op. Cit. Zecchin 1987-9, v.3, p194-5. Thanks to Sophie Small‏ @sophieesmall for inspiring the subject of this post.